With five resident cats in the house now, we’re always on the lookout for a great carrier. We need one for each cat in case of emergency. 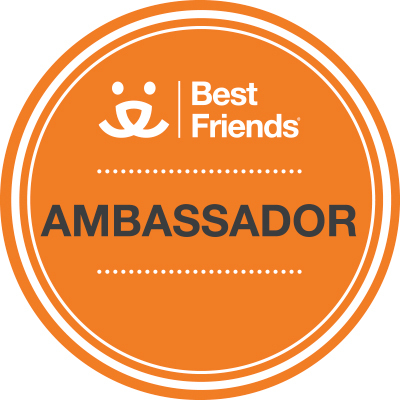 And because we foster on and off, we also have a carrier dedicated to fostering activities, which means we need at least six carriers in the house at all times. 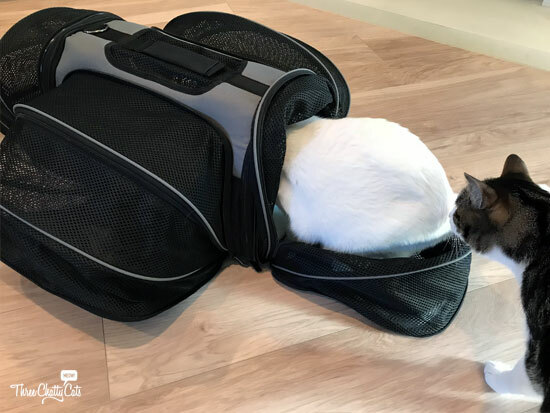 When provided with the opportunity to review the Expandable Soft-Sided Pet Carrier from Smiling Paws Pets, we jumped at the chance! 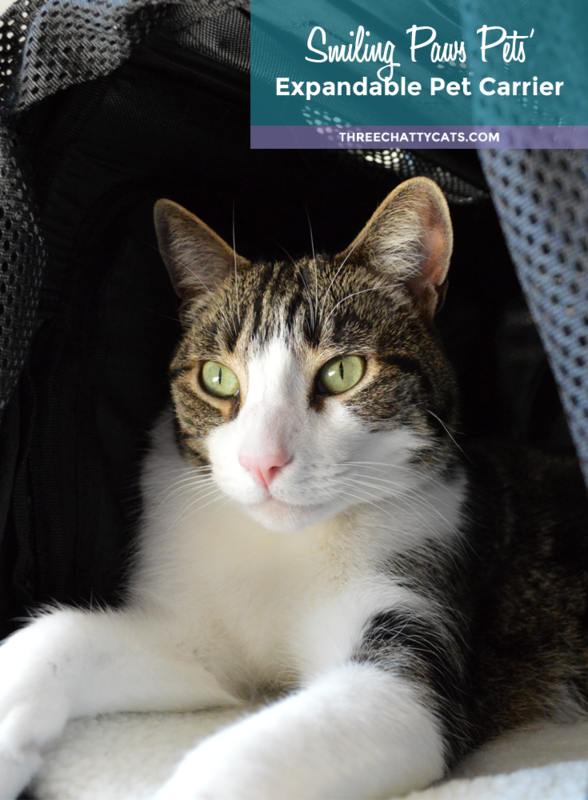 Check out what the cats thought of the carrier and then be sure to enter our giveaway! Smiling Paws Pets sends the carrier in its own carry case. Simply remove it from the case, insert the bottom pad and then zip it up! We received the medium size carrier to review. Woodrow is our biggest cat (longest and tallest), and you can see him standing next to the closed up carrier. I thought it would be too small for him, but read on to see how Woodrow fared. You better believe that as soon as the cats heard me opening up a box, they were right there to inspect everything. 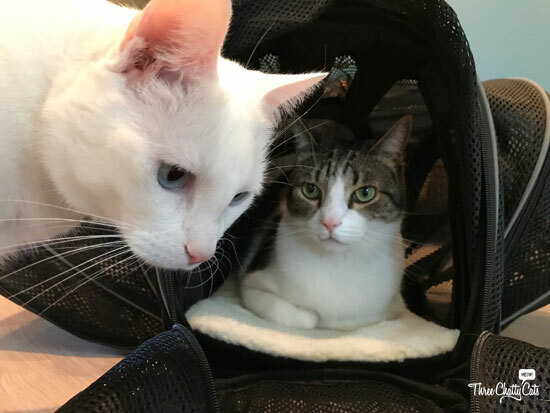 Check out the video below to see if Sophie and Dexter approve of the Expandable Soft-Sided Pet Carrier! As you can see, the carrier from Smiling Paws Pets is approved by both Sophie and Dexter. And did you know that it’s also airline approved? The carrier also offers great air flow through its four mesh sides. And for pet parents on the go, the carrier can be strapped into the car to offer a safer ride for your cat or small dog. If you’re used to using a top-loading carrier, this one does not have that option. However, simply flip it on its side or end – and voilà! You now have a “top-loading” carrier. Just take care to set the carrier back on its base slowly to not jostle your cat. We’ve done this in the past with a front-loading carrier and it’s worked for us. This may or may not work for your cat, depending on their disposition. I mentioned that we received the medium size to review, but they also offer a large size. Dimensions for both are below. When Dexter finally settled in for a nice long sit, Sophie wanted him outta there! Just as Sophie started to settle in, Woodrow wanted his turn and asked her to hurry up. 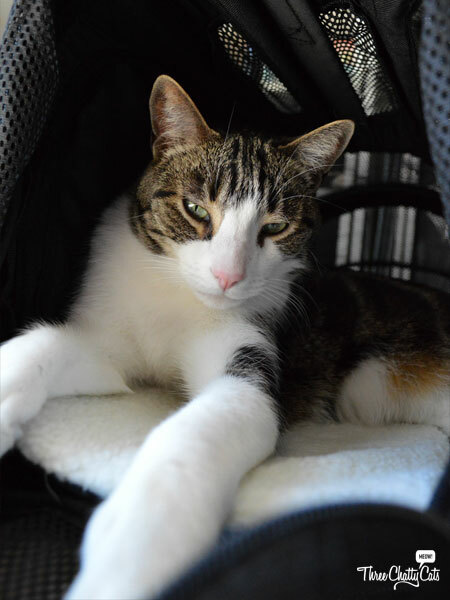 As you can see, the Expandable Soft-Sided Pet Carrier is quite the popular lounging spot! After having the carrier set up for a couple of weeks now, it’s clear that it isn’t a one-time interest item for the cats. The carrier is in my office, and I’ve found either Woodrow, Dexter or Sophie in it at least once a day. Woodrow relaxing in the nifty carrier. Smiling Paws Pets has graciously allowed us to give away one medium size Expandable Soft-Sided Pet Carrier to one lucky reader! Simply enter a blog comment below and then enter the giveaway. The giveaway is open to U.S. residents who reside in the 48 contiguous states, 18+ years of age, except where prohibited by law. One winner will be selected randomly by Rafflecopter and contacted via email. The winner will have 48 hours to claim their prize. Failure to do so will result in forfeiture of the prize, and a new winner will be randomly selected by Rafflecopter. The giveaway closes on Wednesday, March 21, 2018 at 5:00pm Pacific. Smiling Paws Pets is also offering our readers 15% off the Expandable Soft-Sided Pet Carrier until Friday, March 23, 2018. 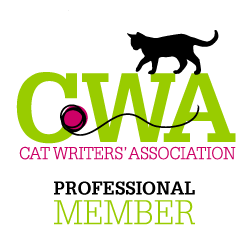 Just enter the code chattycats15 on the checkout page. Order one now! Smiling Paws Pets offers more than just travel carriers for cats and dogs. 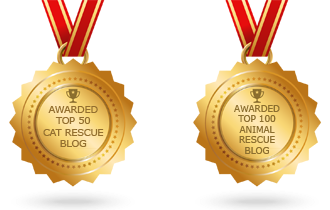 They also have litter mats (check out our previous review), pet beds and odor/stain remover products. 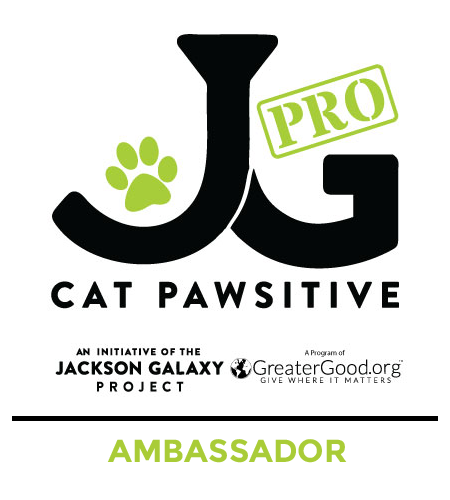 “We create quality pet products to nourish pets & caretakers for a better tomorrow.” Learn more on their website. 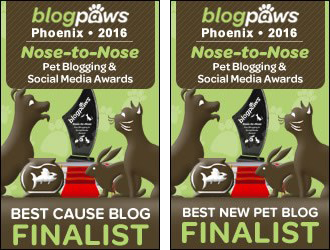 Keep up-to-date with the latest from Smiling Paws Pets on Facebook, Instagram and Pinterest! 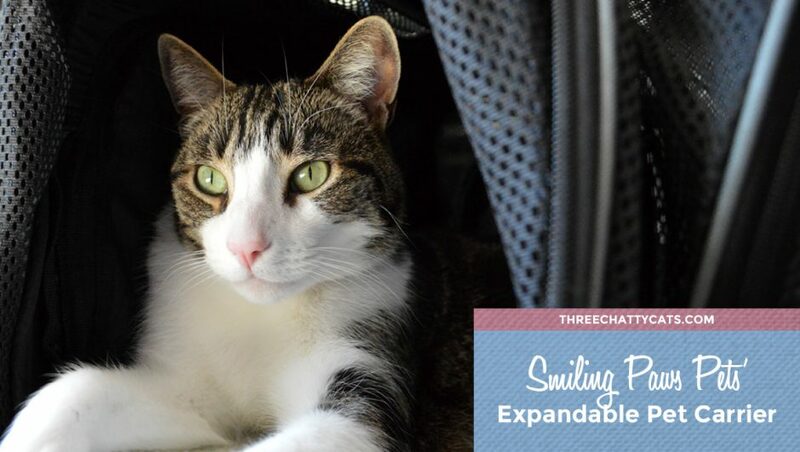 Would your cat enjoy the Expandable Soft-Sided Pet Carrier from Smiling Paws Pets? Next Flashback Friday Photo Fun! Well I do think that’s one of the best designed carriers I’ve seen. The expandable portions are perfect if your pet wants to stretch out (like on a trip) but the other version is still cozy for pets who prefer the security of a smaller enclosure. Very practical! I think even Sammy would not object to that type of carrier! Glad your crew likes it……obviously it’s gone beyond the “taking to the vet” stage at your house into the “great spot for a snooze” ! It’s like the best thing ever, right? We love ours. I was leaving it out in front of the heat vent for Rosie but I kept tripping over it so had to move it to less high traffic area. Rosie did not approve of the move. I am going to enter the giveaway for a friend if that’s OK? Her cat kind of needs one of these carriers. This is a fabulous carrier. I am impressed with the amount of thought that went into the design for what is good for kitties. My cats are different sizes, and this would accommodate either one of them wonderfully. I can see my two taking turns lounging in it as another cat bed just like yours do. Plus, in the Summer when my kitties prefer not to use beds, this would store away easily. I love it! That does look like a nice carrier. Looks like the perfect carrier for my Inky cat who, when it comes time to get in the carrier, develops a few extra legs and becomes twice her size. I love the soft sides and cozy pad. I’m always a fan of products that put the pet’s comfort first. Thanks for sharing about this carrier. Thank you for the review! We have an old hard case and have been looking into options. It’s good to know this is airline approved with the terrible accident that happened on United Airlines. Seeing models in the carrier really helps! Love it!! This looks like such a cool carrier! Lexy would absolutely love this one. Thanks for telling us about it! We were gifted one of these, so I won’t enter the raffle. It’s a great set up; we’ve got plans for using it! I’ve been slowly replacing the plastic hard shells for my 4 cats. I have one on wheels which is wonderful for my 17 pounder but it’s large for my two 7 pounders. This looks like it would be perfect. Sounds like a wheeled one is a must for a 17 pounder! It is. I only pick it up to put into the car. The vet loves it because they don’t have to carry it either! That’s an awesome carrier. Good luck to everyone who enters. The carrier looks really cosy and the kitties seem to enjoy it. I thought it is a lot smaller but seeing how your cats fit in perfectly, it looks like it’s the perfect size after all. What a sweet ride! Not only does it have soft walls, but it looks all comfy and soft inside, too. Not like those stupid plastic carries my peep has for us. I think I’m gonna have to have a little chat with my peep, explainin’ how I have been unjustly deprived. MOUSES! With our bunch and fosters I am like you and need a bunch of carriers in case of emergency and really could use one more. We have one, a cheapy, that we all dislike. Whoa! That’s a nice PTU. If I didn’t hate all PTUs, I’d have wished that TW would have taken this for our review. She says we would like to win one though. The Smiling Paws Pet Carrier looks very cozy but nice to be able to expand for more room too! I think hard carriers have their time and place, such as when transporting a sick kitty to the vet but when traveling or going for a nice relaxing ride kitties need real comfort! This looks purrfect! That is a really nice carrier. We love how it expands. We can always use another carrier around here. That’s a very nice carrier even though we do use the top loaders for us bottom heavy kitties MOL! That’s a really impressive looking carrier! I especially love the mesh on all 4 sides. What a versatile cat carrier! Your cats really seem to be enjoying it! Two paws up on this one!! WOW -they really all seem to love it! and love the last photo of Woodrow looking so comfy! This looks like a really good carrier and I love that it is soft sided that expand especially when you travelling as while waiting for connections you can open up the sides plus it would be perfect if I did dog events for Layla to lie in. This looks like a nice carrier for a cat or small dog. I have both! Anytime you find pets in the carrier of their own volition you know you have a good one! I think leaving it out like that will decrease the stress of having to be in it for a vet visit or other excursion. This looks good. I haven’t tried a carrier with my current cats – except to bring Daisy from the Foster Home to her forever home but I could use a new one. My previous cat ripped soft-sided carriers apart in minutes. She hated being in them. Not sure yet what the new ones will do. This looks like a great carrier/bed. We won’t enter the giveaway because we have a few cat carriers here and are sure someone else can use them. 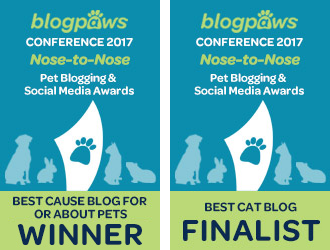 Will we see you at BlogPaws this year? Not this year, but hopefully at a future conference! I had a blast at the one I did attend. The video is super cute! 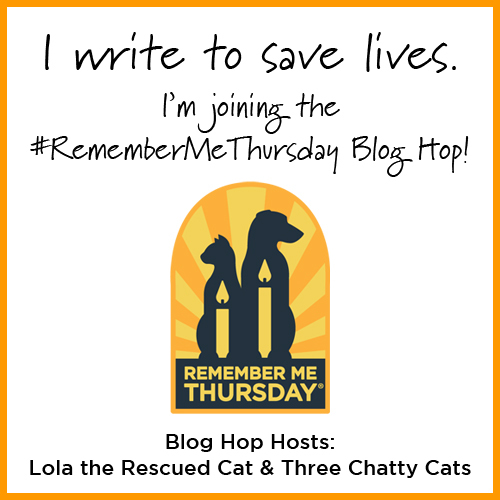 First, I love the name of your blog :-) This was certainly an honest review by the three chatty cats. I approve of the ventilation and the set up…looks like a very practical and well-made carrier. I like how it provides so much room! A friend had a cat mesh tunnel that was sealed that she used to give her cat space when traveling. This looks more compact and convenient. While all three of our cats would love this, I think it would be especially helpful for my senior kitty, Moko. She’s been having medical issues for the past couple of years (hyperthyroid) and that means more frequent trips to the vet than when she was 100% healthy. I have hard, plastic cat carriers for my cat but even with a fleece blanket in the carrier, I’m sure Moko would be much more comfortable in a carrier like this! I like the expandable sides and looks like storage space would be minimal which is important as well. Lovely cat models as always! 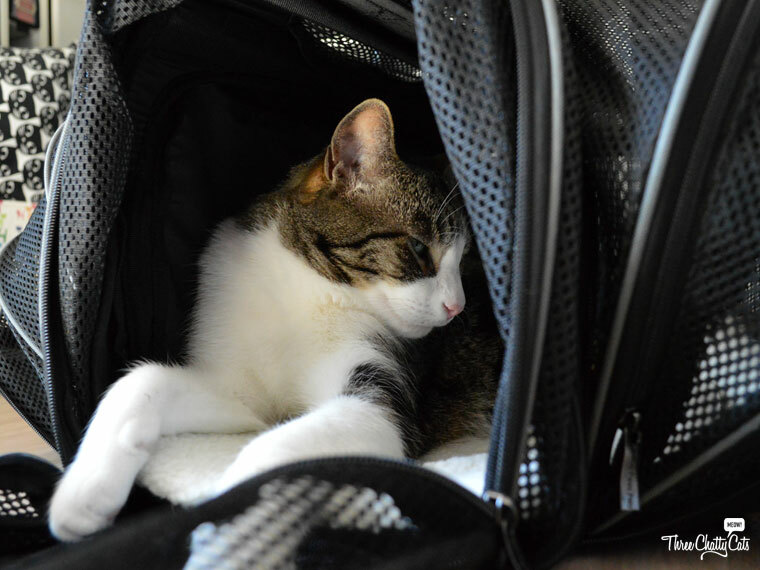 Woodrow looks absolutely adorable in his carrier! So much so that I think I could just look into those beautiful eyes all day! You guys sold me! We recently won a different carrier and since I’ve put it out, one cat or the other has been in it. I imagine the first time one is transported to the vet in the carrier – that will be the end of its popularity, but I’ll take it as long as it lasts! I would love to try this carrier out! This would be great for our cat. This would be so much easier to carry my cat around in than the big, bulky plastic one I have! I have 4 cats ranging in size from 8 lbs to 18 lbs. This carrier looks perfect for them! We just moved 1600 miles with them not too long ago, and they are still look at their old plastic carriers with such mistrust! That looks so soft and comfy for kitties! I love this carrier! It’s so neat how it is expandable, I’ve never seen one like this before. My kitties would love this for trips to the vet or groomers. The Expandable Soft-Sided Pet Carrier is very nice. This looks awesome! My kitty can’t stand hard carriers! This would be nice to take my kitties to the vet. Thank you for the opportunity. Looks like a great carrier, could always use another one! My Dexter would love hanging out in this. The carrier looks really cosy. I imagine any pet that is domesticated and fits would enjoy this product. This carrier looks awesome. Thanks. This cat carrier would be amazing! What a cool carrier! I have to get this for my Wish.